When the weather is warm, the sun and heat can turn food into a breeding ground for nasty bacteria. WASHINGTON — One in six Americans will get food poisoning this year. And while it is common in all seasons, the risk is greater in the summer. 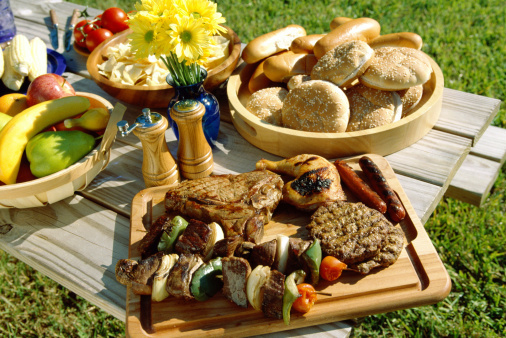 When the weather is warm, many people tend to dine outside, where the sun and heat can turn food into a breeding ground for nasty bacteria. At this time of year, the food safety rules of the colder months no longer apply. The usual rule of thumb — the one always heard around Thanksgiving — is that once food has been sitting out for two hours, it needs to be refrigerated or thrown out. But summer is different. “If the food is in heat, or is sitting in the sun or in temperatures higher than 90 degrees, that two hours is now decreased to one hour,” said Dr. Linda Nordeman, medical director of the emergency department at Adventist HealthCare Washington Adventist Hospital. Nordeman said the longer food sits out, the greater the risk. Salads and other foods with mayonnaise have long been thought to be particularly troublesome, but studies have indicated commercial mayo, which contains vinegar, in and of itself is not the problem. Instead, other low-acid ingredients, such as chicken or shellfish, could be harboring unwanted bacteria. But whatever is at fault, there is no denying that a case of food poisoning is enough to make anyone miserable. “It consists mostly of nausea, diarrhea, maybe some abdominal cramping,” Nordeman said. She said most cases just run their course and are fairly easily treated at home with rest and hydration, starting with small sips of fluid and maybe some ice chips. But if the symptoms persist and you start to become dehydrated, develop a high fever or notice blood in diarrhea or vomit, it is time to seek medical attention. “Those things really should prompt you to go see your doctor,” Nordeman said.